I like how the author gave first the trading "jargon" that could help weigh the readers knowledge. And it's really a good way to familiarize with these terms before even starting the chapters ahead. 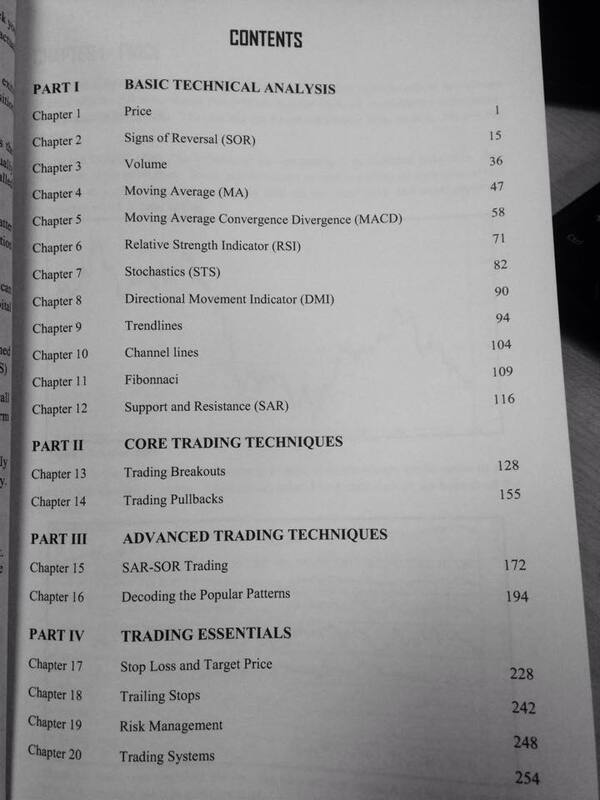 The Chapter 1 is all about PRICE which is the most important element in the chart. It's really true when he said that most traders are so used to putting all types of indicators and missing the most important component of the chart. I've been there and honestly, too much indicators won't help you if you don't know the basic element which is the price action. Too much clutter on your chart would also clutter your analysis. It was also discussed in Chapter 1 the 4 stages of Price action which are the accumulation, markup, distribution and markdown. 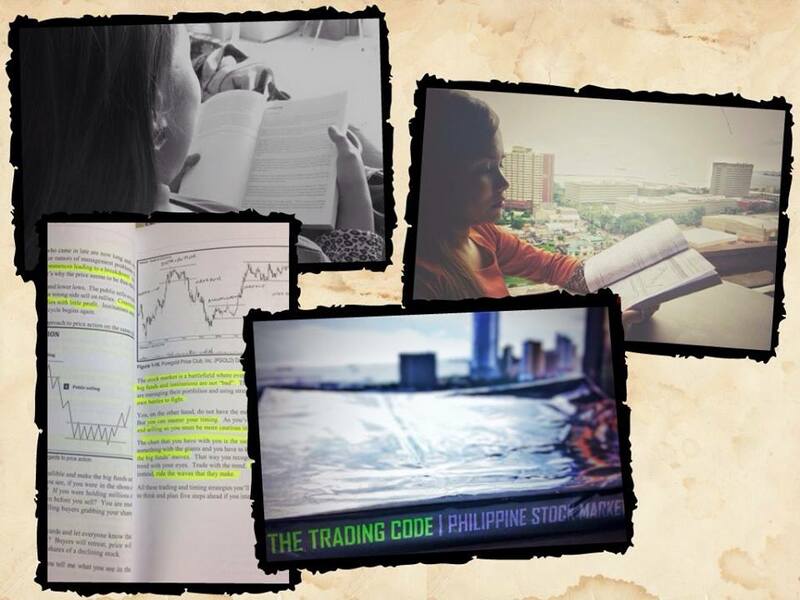 Here's a sample of how the stages of price action happened in TAPET. The stock market is a battlefield where everybody is trying to outsmart everyone else. Signs of Reversal (SOR) was the entire topic for Chapter 2. It's mostly about candlestick or combination of it that gives signal that the prevailing trend is about to change its direction. 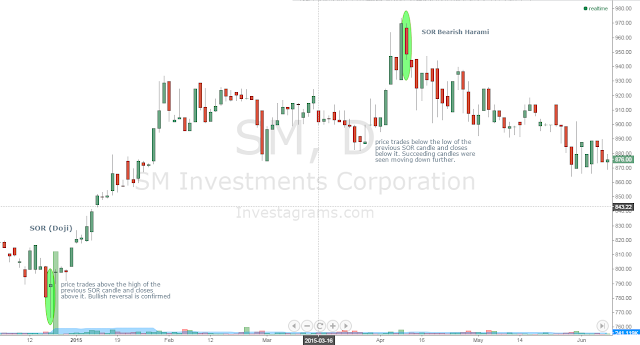 Signs of Reversal seen on SM chart. There are subtle hints that you see on the chart in the form of SORs. The Chapter 3 was all about Volume and so far my favorite part as I have completely ignored this indicator ever since I started my journey in trading. It was indicated in this chapter that volume provides us with unique and invaluable information that cannot be replaced by any other indicator. I recently saw his post on PPC which I had last week. 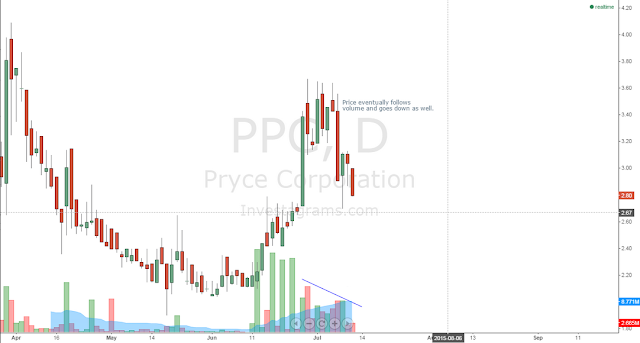 But yeah, we're playing with probabilities so even if this is forming a pennant with declining volume, you'll never know if the big whales decided to moved out of this stock. I then realize that PPC is already forming a handle (cup with handle) chart pattern in a bigger view. previous spike in this stock, including myself. Volume indeed can start, validate, or end a trend. It's the second most important piece of evidence (price is first) we need in strengthening our trading decisions. Hi Manel, I hope your name is searchable in FB if not I will exhaust my time looking for you(heart eyes) haha. Nice review! I was looking for a review about this book and all are positive. Thank you for the effort of writing the reviews about it. Hi Manel, I just hope your name is searchable in FB or else will need to exhaust my time looking for you(heart eyes) haha. Nice review! Thank you for having the time to write down your review. I was looking for a review about the book and all give a positive reviews about it. Nice one Manel. Explored the Beautiful Islands in the Northern part of Cebu!